The playa lakes of the southern High Plains are a critical way station for waterfowl. Between the Black Hills of western South Dakota and the Pecos River in southern Texas, there's an expanse of open country that is still big enough to daunt a traveler, even if he's clocking 80 miles an hour with the air conditioning at full throttle. Every 50 miles or so, a river has cut a modest valley and slips off to the east, but between the drainages, the land looks as if it's been leveled by surveyors. In many places, it's so flat that a drop of water hitting the ground can't make up its mind which way to run -- it just sits there until it soaks into the ground or evaporates. This is playa lake country. The playas are shallow basins covering as little as 800 square feet or as much as 1,200 acres. After a snowy winter or wet spring, they fill with water, much like the potholes of the northern prairies; without a steady source of local water, they shrink and the smaller ones dry up entirely. In a normal spring, there are at least 50,000 playas on the High Plains, almost 20,000 of them in the Texas Panhandle. It's hard to say how many birds used the playas before the High Plains were settled. Few people visited this part of the world casually, and most of the ones who made the trip were too distracted by immense herds of bison to report on lesser game. In the summer of 1845, Lieutenant James Abert and his expedition visited the Staked Plains of the modern Texas Panhandle where they found "large shallow pools covered with flocks of ducks," which they did their best to thin. The playa lakes continued to attract waterfowl in the 20th century. Maps of winter range drawn in 1930 showed birds in the Texas and Oklahoma panhandles. For generations, the main crop in the region was grass, but as early as the 1930s, farmers began using groundwater to irrigate crops. By the early 1950s, cheap energy, new technology and an ancient deposit of sand and gravel combined to transform the western plains. The deposit is known as the Ogallala aquifer. Stretching from Nebraska to central Texas and New Mexico, the Ogallala is a gigantic subterranean reservoir that once held almost as much water as Lake Michigan. Some of this is fossil water. The rest is water that finds its way down from the surface through the sand of riverbeds or the bottoms of playa lakes. The recharge process is slow -- in a typical year about a third of an inch of water finds its way down from the surface -- but over the course of the millennia, the resulting reservoir of water is astonishing. In some places the saturated Ogallala gravel is hundreds of feet thick with water moving downhill through it like molasses at the rate of about 150 feet a year. As it became practical to bring Ogallala water to the surface, a whole lot of ranches on the plains became farms. It's been estimated that 65 percent of all the irrigated acreage in the United States today is on the High Plains. The shift is evident in Texas farming statistics. In 1950, the state raised 57 million bushels of corn; in 2000, it raised 236 million bushels. Much of the increase came from the irrigated fields of the Panhandle. Waste grain was a mixed blessing for wintering ducks and geese -- on one hand, it provided a huge new supply of carbohydrate-rich food; on the other, it was low in protein and other nutrients. Irrigation itself also had mixed effects on waterfowl. Irrigation water helped fill playas when snow and rain didn't, but row-crop farmers filled or drained many playas and deepened others to act as tailwater pits. The deeper ponds held water longer than the old playas, but they had less shallow water and produced less natural food and cover as a result. And plowing around the margins of playas reduces the amount of food and cover, just as it does in the prairie potholes. The new landscape was a complicated tangle of shifting climate, farming practices and ecological responses, but for 30 years or so, it was a dependable oasis in the Central Flyway, and the numbers of waterfowl wintering there continued to grow. The mid-winter inventory in 1981-82 found 187,000 mallards in northwest Texas alone. During one particularly favorable winter in the 1970s and early 1980s, more than 800,000 pintails passed the winter in the Panhandle. Snow geese and Canadas recognized the reliable source of food and water as well. Unfortunately, the aquifer couldn't sustain the growing demands of irrigation. By the late 1950s, water levels in some parts of the Ogallala were dropping as much as five feet a year. Faced with the rapid decline in available water, farmers have taken steps to use it more carefully. Still, the water level in the Ogallala on the southern plains continues to drop. Studies done in the last five years suggest that the top of the water table may drop 150 feet or more by 2050 -- in some places that will mean no more groundwater. This loss of groundwater will have several effects on the southern plains and their waterfowl. First, many of the springs that feed rivers in the region will become less dependable or may dry up entirely. Reservoirs will shrink or dry up, especially during droughts, depriving ducks and geese of the roosts they've learned to use over the last 50 years. This has already happened on the Buffalo Lake National Wildlife Refuge south of Amarillo and the Optima National Wildlife Refuge in the Oklahoma Panhandle. Less standing water will mean fewer wintering waterfowl. Farmers who are anxious to reduce their demands on the aquifer will choose crops that require less water. As the amount of waste grain dwindles, more birds will move elsewhere. More careful use of irrigation water means less run-off. Playa basins that have been filled as an unintended consequence of farming will once again fill or dry up as the vagaries of rain and snowfall dictate. These kinds of fluctuations have already emerged in the Texas Panhandle. Bill Johnson, waterfowl biologist with the Texas Department of Wildlife and Parks, has been following duck numbers in the Panhandle. In 2001, only a few playas had any water at all, and more than 90 percent of them froze during the winter. That year, less than a thousand pintails and about 10,000 mallards showed up on the mid-winter survey. In 2005, more than half the playas had water, and most of them stayed open through the winter -- the mid-winter count found 225,000 pintails and 160,000 mallards. 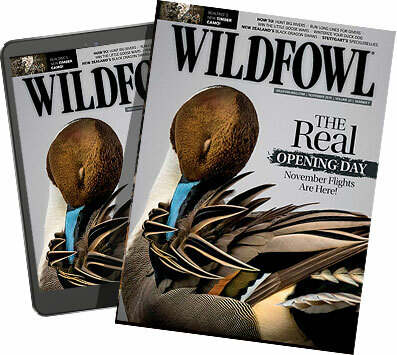 In 2001, less than one percent of the waterfowl wintering in Texas stayed on the High Plains; in the mild, wet winter of 2005 that proportion jumped to 13 percent. il numbers are five or six times greater in the spring than during the winter. Stops like this on the way north are crucial for early spring migrants like pintails and mallards. From a waterfowler's point of view, the playas are clearly worth keeping, but that effort faces several challenges. The federal Wetlands Reserve Program (WRP) has been used to protect wetlands on private holdings in many key waterfowl habitat elsewhere, but up until now WRP money hasn't seen much use in the playa lakes country. However, there is other federal aid at work. In 2004, the Wetlands Restoration Initiative became part of the USDA's farm programs. The initiative will focus the Conservation Reserve Program budget on the High Plains of Colorado, Kansas, Nebraska, New Mexico, Oklahoma and Texas -- the goal to restore more than 50,000 acres of wetlands. There are other ways to protect the playas, too -- no-till farming can reduce erosion, and buffer strips of grass will keep soil from burying playa basins. But these kinds of conservation precautions only happen when a little savvy, some money and a collection of interested people arrive at the same point at the same time. The Playa Lake Joint Venture (PLJV) helps that rendezvous happen. Since 1990, PLJV built agreements with landowners, industry and state and federal government to protect more than 100,000 acres of habitat on the High Plains. In 2002, they launched a playa lakes improvement program in Kansas and Oklahoma that has proved immensely popular -- there are more landowners interested in the program than there is funding. On one hand, the PLJV's successes are heartening; on the other hand, the magnitude of the job ahead is staggering. The venture's projects are measured in thousands of acres, the High Plains cover well over 100,000 square miles, nearly all of them privately owned. Keeping a place for waterfowl on this landscape over the next century will be a daunting task. There is a silver lining to the situation, however. As farmers cope with the decline in the Ogallala aquifer, there will be chances to help waterfowl and other wildlife. The key to success is being ready for those chances as they emerge. The hunter's part in this is the same as it has always been -- help provide the money and the political support to keep outfits like the Playa Lakes Joint Venture running.